Take That, You Dirty Rats! Or so claims Tolec, human representative of the AC on earth. 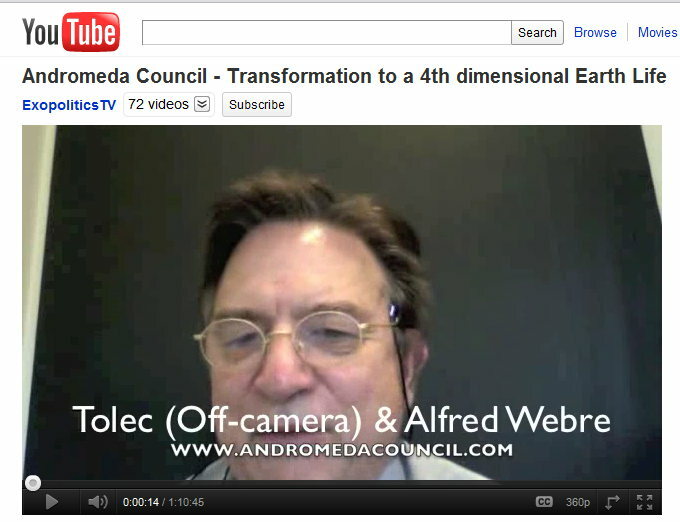 In a YouTube interview dated Sept. 30, 2011 (http://youtu.be/mRpCV3pK6jY) Tolec spoke off-camera with Alfred Webre, exopolitics writer/researcher, about the DUMBs (deep underground military bases) where evil reptilian and gray aliens have been feeding off the intense emotions of unsuspecting humans. Those emotions have been generated by beam weapons that stoke hate and fear, causing more conflict and violence, especially in places like the Mid-East. Tolec claims the aliens feed on these emotions like psychic vampires. Smacks a bit of sci fi, huh? The hidden underground bases sound like they’re straight out of a Richard Shaver story. His tales appeared in the old pulp magazine, “Amazing Stories,” but he claimed they were based on truth. Beneath the earth lurked the Deros who preyed on mankind above. One reader wrote to the mag to say that he knew the Shaver Mystery was true; his wife heard voices and it had to be those damn Deros. And as for feeding on emotion, Eric Frank Russell wrote a novel called “Sinister Barrier” (1939) that involved glowing blue critters called Vitons, mental vampires that liked stirring up trouble for mankind to satisfy their cravings. But who’s to say that life can’t imitate art, that is, the art of SF? Hey, I’m into new vibes. 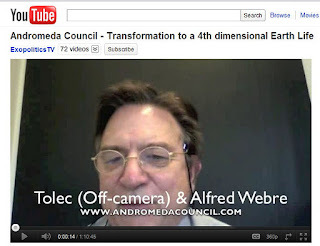 During one interview with Alfred Webre, Tolec explained that the Earth is now traveling into an area of space that is starting the shift. It’s happening right now. People of Earth will have a choice to move on to the higher 4D plane where their bodies will become lighter and crystalline. Crystalline? Knowing my luck I’ll end up with 4D kidney stones. Tolec claims that the reptilian and gray underground bases are being taken out so that the evil aliens won’t be able to interfere with the 4D shift. So if a tremor somewhere in the world makes the news – and Tolec does track them – don’t be surprised if you hear that it’s evidence of another sinister DUMB being taken out. 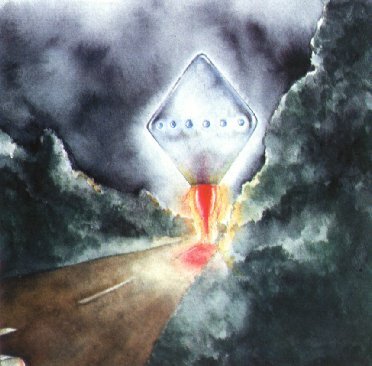 Was the Cash-Landrum UFO really a secret military project that screwed up? December 29th, 1980. Two women and a boy are in a car traveling on a road through thick woodland, on their way to Dayton, Texas. Their journey is interrupted by a strange diamond-shaped craft floating over the road being escorted or pursued by military helicopters. The bottom of the UFO is open, emitting light and heat. The UFO leaves with the helicopters. Later, the three people in the car suffer health problems after the incident, apparently related to radiation exposure. In his zine, “Saucer Smear,” Jim Moseley has been taking another look at the case. He mentioned it to me in a recent phone conversation to see if I could dig up any info online about the case like others have done for him. I also searched for “atomic power aircraft” and discovered back during the Cold War about attempts to build a nuclear powered airplane. Even the evil commie Russians were working on such a craft. I can see it now: two ato-planes collide in the air over a populated area. Time to call in the FAA and the NRC. I wonder who would have jurisdiction over the investigation. So far no real hits related to the Cash-Landrum UFO as a secret US military FUBAR. Sorry, Jim. I plan to write more about ato-vehicles – cars and planes -- when I have more time to follow up. www.x-rayer.com -- Takes you straight to this blog. www.x-rayer.info -- Access to my newer Website. With each one, don't forget the hyphen. And my old Website, www.rayxr.webs.com, still features an archive of my print zines. With the eXception of creating my zine, today was a lot of nothing. Very quiet here in the one-man “monastery.” My personal reaction to it all: ThanX for nothing. And people wonder why I hate the holidays. At least I enjoyed the traditional microwaved lasagna. That sounded nasty. I wasn't familiar with the term until its ugly head reared on the Liberty Net Stickam site (http://www.stickam.com/libertynet) early Sunday morning (9/20/11). Besides broadcasting over shortwave radio, the ultra-right-wing amateur radio operators also communicate with each other online through both audio and text. When the site is live it has a comments section for typing in reactions to the audio discussion. The comments just keep scrolling up, the newest on the bottom. Unfortunately they disappear when the site shuts down. dhauer: All anchor babies should be dumped..
With a quick Google search (e.g., "anchor baby myth") I learned that the pejorative "anchor baby" refers to a child born in the United States whose parents are immigrants. That child is automatically granted US citizenship under the 14th Amendment, supposedly "anchoring" his parents so that they can also become American citizens. Of course, some of the angry white men on the LibNet believe this is a threat to the dominance of their pure race. But according to sources I found online, the threat -- if you call even call it that -- isn't real. Getting US citizenship is difficult for most immigrant parents. It's notable that the Liberty Net is using the Web to get the word out but the Web also provides a quick way to fact-check any claims heard during their weekly gatherings. So why did the LibNetters set up a Stickam site? For years the Liberty Net has dealt with the problems of poor reception conditions and jammers. Heard mainly on the east coast, the net in the 75 meter band usually starts at 10 PM Saturday (Eastern Time) and spills over into early Sunday morning. Picking up the transmissions from various parts of the county is problematic with a shortwave radio: reception is all in the lap of the propagation gods. The LN member who operates the Stickam site picks up the SW transmissions on his ham receiver and then streams the conversations online in clear audio. But even when reception is favorable other radio operators who don't care for the "Liberty Nutters" will jam the frequency with Morse code transmissions, noise, loud music, whatever. Stickam provides a way to work around the jammers: participants can now phone in through Skype and share their thoughts. So while a ham may be jammed on the air, callers still can voice their opinions online without interference (well, until the hackers show up). I've been following the Liberty Net for years to track the latest news in conspiracy theories (Illuminati, New World Order, etc.). But I'm not a fan. I disagree with most of their ideas, especially stupid statements like drowning anchor babies. Sometimes even I feel like blocking their speech. But ploys like jamming actually make the problem worse. If you can't hear someone, you can't comment on his opinions. Burying unpopular views doesn't kill them off. I'm a fan of free speech. Getting things out in the open. And getting the facts right.